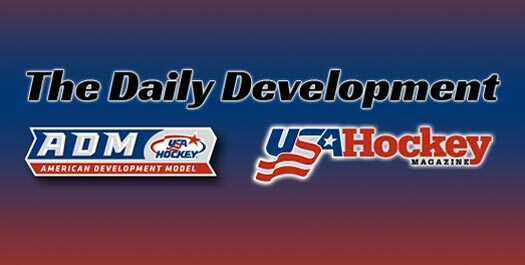 USA Hockey Magazine is teaming up with the American Development Model to create The Daily Development, an online clearinghouse of news and information focused on long-term athlete development. ADM regional managers and USA Hockey’s staff members have amassed an impressive collection of articles and information pertaining to the common sense benefits of long-term athlete development (LTAD) from some of the world’s foremost experts in the field. The Daily Development will employ USA Hockey Magazine’s Twitter account (@usahmagazine, #dailydevelopment) to serve as a delivery system to the youth hockey community to tout the benefits of LTAD, which is the cornerstone of the ADM principles. In addition, every article will be archived at USAHockeyMagazine.com to provide free and easy access. Giving children the freedom to develop their own games improves their social skills and reasoning. Joe Mauer, who played three sports in high school and is the only high school athlete to be named ALL-USA Player of the Year in two sports, says athletes may be focusing their efforts too early. Scientists call it the "sweet spot" - that highly productive zone on the edge of our abilities where learning happens fastest. The problem, of course, is that the sweet spot doesn't feel sweet. In fact, it feels sour and uncomfortable, because being there you have to take risks and make mistakes. And most of us hate making mistakes. A few days ago I was sitting at our practice rink which was at the time being used by a youth association playing a PeeWee game. As I was watching the game I could hear the coach of one of the teams yelling for his 11-year-old forward to "dump it in." On Nov. 3, thousands of kids participated in Try Hockey for Free Day. One young boy from New Hope, Minn., spent that Saturday morning flying around the ice, looking more like a second- or third-year Mite than a first-time skater. Yet, his mom claimed he could barely stand up the previous year when he was first introduced to skating. How could a child show so much progress over the course of a year with no additional ice time or hockey specific training? I grew up in small a prairie town. I lived my first 10 years a short skate down icy 8th Street to the rink in Carman, Manitoba. From November to March, the snow pack was so hard on the side streets that I could skate from the end our our driveway right to the front doors of the rink. Today, more and more parents are enrolling their kids in hockey 10-12 months of the year, with the hope their children will become better players. Talking Hockey with Rand Pecknold from Relationsmith on Vimeo. If your child is just starting to play soccer, the most important thing is to forget about the game result. This is the philosophy at the Total Soccer Systems Academy in Richmond, B.C. as they work with children in the U6 and U7 age groups. TORONTO -- When Al MacInnis would wind up for one of his light-speed slap shots, almost everyone on the ice and even in the stands would duck or dive out of the way. Not Joe Nieuwendyk. He never worried about the flying frozen disc that was coming fast, hard and heavy off of MacInnis' blade hitting him, because most of the time he knew what the Hall of Fame defenseman was aiming for. "I think a lot of people feared Al's shot, so he was looking for me in those instances," Nieuwendyk said Monday morning from the Hockey Hall of Fame, several hours before he officially becomes an honored member like MacInnis, his former teammate in Calgary. "Every now and then you'd take one, but the reward was much greater than the danger in my opinion."